Weight gain is ultimately a symptom of imbalance and this weight loss program is designed to address those imbalances. There are a number of physiological causes for weight gain and difficulty losing weight. Some of these imbalances are related to the endocrine system and involve stress hormones like cortisol, which affects insulin, glucagon and growth hormone. Thyroid dysfunction, loss of estrogen or an imbalance of estrogen to progesterone, and loss of testosterone can all make weight loss incredibly challenging. Neurotransmitter imbalances can cause cravings and emotional eating. Excessive inflammation in the body due to oxidative stresses, food and/or environmental allergies can make losing weight next to impossible for some. Poor sleep, poor digestion, and nutritional deficiencies often contribute to hormonal imbalances. Pain can make movement and exercise difficult. Poor meal composition and even the bacteria we carry in our gut affect our ability to lose and maintain weight loss. It really is not as simple as calories in must be less than or equal to calories out. Conventional diets have roughly a 5% success rate. There is an entire industry propelled by promises of weight loss and success. Yo-yo dieting has become the norm and the more we yo-yo diet the harder weight loss becomes. We are a culture who is dieting ourselves up in weight. 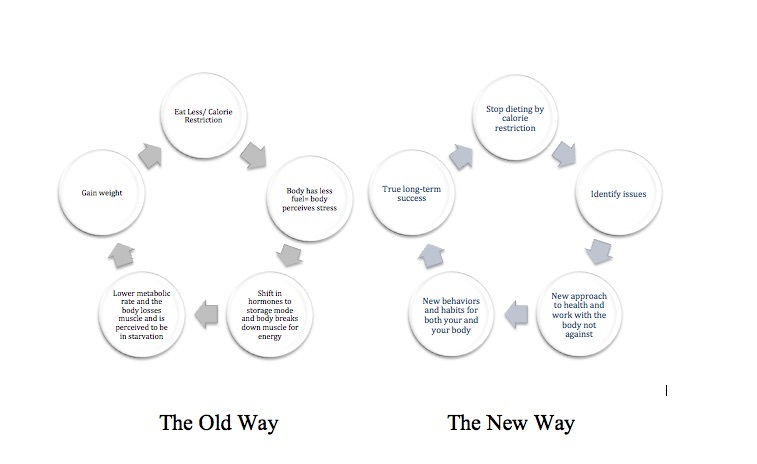 How does the holistic approach to weight loss differ than others? First, we start by laying down a healthy foundation for successful weight loss and maintenance. The first couple months of working together we will be addressing any hormonal imbalances, allergies or sensitivities and focus on improving general health. We will discuss realistic goals and prepare the body for eliminating its excess stores so you start feeling more energy and improved sleep, which are both essential for weight loss. After we prepare the body for weight loss we initiate the weight loss protocol, which is not a strict caloric restriction diet, but more about what you will eat and how you eat it. The diet is based on the use of real foods and is in protein with very minimal carbohydrates. The meals are very sustainable and many people feel great on this type of diet. The biggest difference between this approach and others is maintenance. This diet teaches you how to eat and how to maintain your new weight, unlike many other diets. It is not restrictive and you should NOT feel hungry during the weight loss period at all. There are supplements and herbs that may be supportive during the weight loss period to address emotional issues that may come up, help with difficult cravings, or stabilize blood sugar and support digestion. The treatment is really tailored to your individual needs.